I've been meaning to make a strawberry shortcake for a while now, and finally got around to it this weekend. It was the perfect dessert to bring for a post BBQ meal - it tastes light (it's not really, but the airy whipped cream makes it feel like it is!) and it's pretty quick to make. I omitted the gelatin though - firstly because I didn't have any, but also because a couple of our friends don't eat meat. Made with animal product (think collagen derived from animals' skin and bones) it's really not the nicest thing to slip into a cake when some of your friends are vegetarian. The cake turned out fine without it, and I don't think the gelatin would have added that much more to the texture of the cream. This is one of those great dessert for big gatherings. It presents very nicely, boosts great summer colors and, most importantly, is delicious. Make topping: In a large bowl, combine strawberries and 1/4 cup sugar; set aside. Using an electric mixer, beat cream and remaining 1/4 cup sugar in a large bowl until very soft peaks form. This looks wonderful and I'm sure it looks as good as it tastes. A passing thought --- I thought that gelatin was used just to stabilize whipping cream and keep it from weeping. Have a wonderful day. Oh, this is one of the prettiest ones I've ever seen! I like the fact that it's a cake, and not individual biscuits, just for a change (although I like that version too) I would love to try this for a summer dessert, so thank you for sharing! that's not just strawberry shortcake, that is the way it should be done, period. Mary: The gelatin helps settle the texture of the whipped cream. Mine worked well without it. It served it the same day that it was made though - so the gelatin might help if you're planning on serving the shortcake the day after. 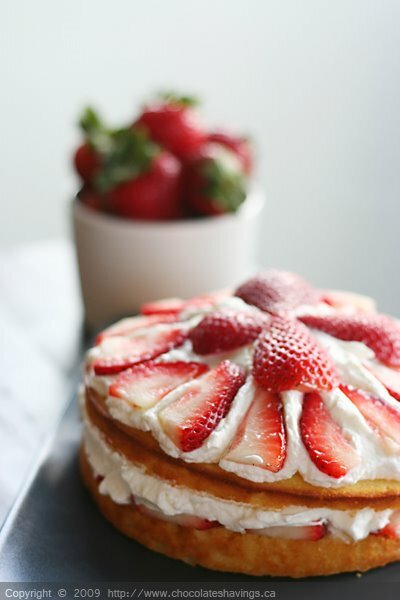 This strawberry shortcake looks absolutely delicious!! I am definitely craving the subtle sweetness of this fabulously summer dessert right now. And yours looks not only gorgeous but oh so tasty. Man, I need to get into the kitchen! That is so lovely. I know my husband would go crazy if I made that. As a veg, I so appreciate you being mindful of gelatin. Most people don't know where it comes from. I love strawberry shortcake, and yours is beautiful! O, this looks absolutely delicious! I love most strawberry desserts and this looks perfect! Uhh you made this to taunt me didn't you. I can't make anything strawberry because of Ian's alergy to them and it pains me so! I have been craving strawberries since I meet him. Please send some through the mail. I will be waiting. What a gorgeous picture and the strawberry shortcake sounds absolutely delicious, perfect summer dessert! This looks beautiful! I've been meaning to make a strawberry shortcake in actual cake form, instead of individual biscuits. Thanks for sharing! MMMMMMM Yes please I'll have a slice! It looks wonderful! I've been wanting to make one as well. I like that this is one big one as opposed to a bunch of small biscuits. What a great strawberry shortcake! It's gorgeous, and I know it's delicious. That is beautiful, the PERFECT summer dessert! I loveee this!! heck I could eat your whole blog!!! Yummmy! What a lovely summer dessert! Pretty pretty! That looks nice and light and refreshing and good! And what a gorgeous gorgeous blog too! Oh the dessert is so professional looking. Well done! It could be one the cover of the next Gourmet magazine. Yuuuuum. I just made this recipe for dinner and everyone loved it! I added more strawberries because, well, can you have too many strawberries? Absolutely delicious. Looks like you've got a thing for strawberries too. This certainly makes me hungry for a slice. Thanks for stopping by my blog and allowing me to find yours. Such a pretty little shortcake. I always love strawberries sitting pretty on top of desserts. so beautiful!I love it! Very creative!That's actually really cool. I agree with Dawn. This is exactly how a strawberry shortcake should be made. I'm bookmarking this!